White bearded and unbearded Silkies have feathered feet, mulberry colored skin (also referred to as black skin), blue earlobes, walnut comb, white soft silk or satin feeling feathers, possess five toes on each foot and have a sweet, calm personality. White Silkie hens lay 3 to 4 cream or lightly tinted colored eggs per week and go broody easily. 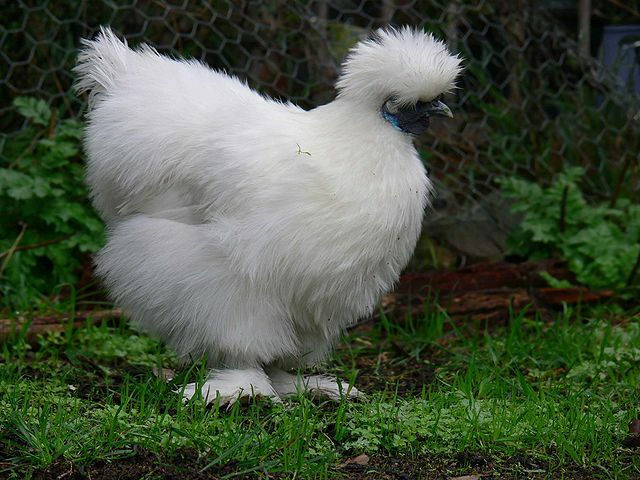 ​​"The earliest surviving written account of Silkies comes from Marco Polo, who wrote of a "furry chicken" in the 13th century during his travels in Asia" (Silkie, Wikipedia, 2019). If you are breeding for show, only breed white silkies with other white silkies which meet the APA Standard of Perfection. Silkie chickens make great backyard pet chickens. I have several of them and they are so sweet both male and female. They don't tear up gardens as bad as most other larger breeds and are much easier to clean up after and take care of than Standard size breeds. However, some males can become quite protective when someone approaches their hens and tend to jump and attack (normal rooster behavior actually but most of my Silkie roo's are just as sweet as the hens). I have many male silkies but only one of them shows this type of aggressive behavior. However, even when aggressive he is pretty harmless, unlike some standard size breeds that can really hurt someone when they attack.